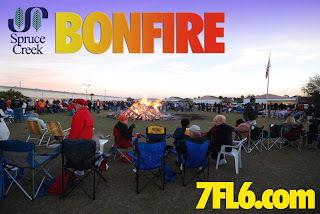 SPRUCE CREEK - The annual Spruce Creek Fly-In Community Bonfire Event was held last night at "The Tree" in Windsock Park. This year's event saw a historic record attendance by residents and their friends at the world famous airpark community in Port Orange, Florida. The bonfire was kicked off by a formation exhibition by members of the Spruce Creek Gaggle Flight Team which made several passes with trailing smoke for the enjoyment of the spectators. The Gaggle Flight Team is composed of residents of the Spruce Creek Fly-in which graciously donate their time and aircraft to complement many area events. Residents braved the cold weather with temperatures dropping all the way down to 49° F, considered "cold" in the balmy North-East Florida area. All attending the event were treated with delicious country fried chicken and baked beans while socializing with fellow neighbors. In addition, there were several tables with desserts ranging from home made cookies to brownies and cakes. Soft drinks for the kids and beer kegs for the grey-haired kids were also served, all free of charge and sponsored by the Community Relations Committee of the Spruce Creek Property Owners Association. The bonfire at the center of the event brought warmth and a festive atmosphere. There was also a smaller bonfire where the children's roasted marshmallows. The Spruce Creek Children's and Recreation Committee handed out glowing bracelets much to the delight of the little ones. I think it is a great article. Reading this should make everyone want to attend next Year.